800 800 0% off in Rs. India is one of the leading Herbs producer and exporter in the world. Several meticulous researches were conducted and experimented with herbs. They arrived at more precise conclusions about the usefulness of diverse plants and herbs that are utilized in different fields like medicine, cosmetics, perfumes and so on. The Ayurveda healing is completely based on herbs, which have definite medicinal importance or significance. In the primeval times, the Indian sagacious held the view that ayurveda herbs are the only resolution to treat numeral health related problems and diseases. Herbal products are replacing the synthetics products because of its harsh nature. Herbal products are in huge demand in the developed world for health care for the reason that they are efficient, safe and have lesser side effects. Growing herbs is easy to do, and people continue to turn their love for gardening into successful businesses growing and selling fresh cut herbs, herb plants, and other herb related products. The book makes an attempt to provide information on cultivation and utilization of herbs. The book also contains the described process of the cultivation of medicinal herbs, spices etc with photograph and diagrams. This book also describes about the role of perfumery, analysis of essential oils and flavors, recent development of some natural products and more. This book covers the comprehensive information on herbs cultivation & their utilization. We hope that this book will be very helpful for new Entrepreneurs, Herb Growers, professionals & research Institutions. 19. CULTIVATION OF KAEMPFERIA GALANGA L.
The name Senna has been given to the species of Cassia which are used as the sources of the sena laxative. The botanical name of the Indian senna plant is Cassia angustifolia Vahl. (Cassia sena). This plant is believed to have its origin in north Africa. It is found growing as perennial bushes in arid tracts of Somalia, Ethiopia, Sudan, Egypt, southern Arabia and their neighbouring countries. The plant is found growing in a wild state in certain coastal parts of Gujarat especially in the Bhuj region of India. Apparently, the plant must have been introduced into India from its endemic areas in north Africa sometimes in the past. Over the centuries the plant has become naturalized in India. The plant can be cultivated all over the subtropical areas of India. However, its cultivation is presently concentrated in the semi-arid parts of Tamil Nadu, Rajasthan and Gujarat. The leaves, pods and seeds contain the anthraquinone glycosides called the sennoside A and Sennoside B which are used in pharmaceutical industry for prepairing preferred laxatives. The plant has been used in the traditional system of medicine for the same purpose . Its material in the dry powdered or decoction from has been used as a stimulant, vermifuge and cathartic, and for relieving habitual constipation. India is presently the main source of cultivated senna. Large quantities of dried senna leaves and pods and their partially processed material are exported to USA, European countries, Japan and Australia. In the importing countries the sennosides are added to various items of food and confectionery, besides the pharmaceutical preparations. Presently, senna is one of the major item of export from India in the area of herbal material. the demand for senna is observed to be ever increasing. Senna (Cassia angustifolia 2n=24), Family Caesalpinaceae is a small perennial shrub of less than a meter in height with ascending branches. The leaves are compound pinnate, petiolated about 10cm long and bear 5-8 pairs of leaflets each on a small stalk. The leaflets are bluish green to pale green in colour, coraceous in thickness and emit a characteristic foetid smell when crushed. There are 2.5 to 5cm long and 0.5-1.5 cm broad, oval lanceolate in shape with acute apex and smooth underneath. the flowers are bright yellow in colour, arranged in axillary, erect, many flowered racemes, considerably extending the subtending leaf. It has short, ovate, membranous bracts, which fall off early. The pods are slightly curved, 3.5-6.5 cm long and upto 1.5cm broad, light green in colour, changing from greenish brown to drak brown or black on maturity. A pod encloses5-7 obovate compressed, smooth, pale whitish seeds. Flowers and pods are formed on the cultivated plants in May and June in the north western parts of Indian subcontinent. Senna crop is in the process of domestication. Seeds collected from the wild plants and pooled together have been the resource material for the cultivation of crop in the different parts of the country. The proper breeding experiments towards development of standard varietieshave been initiated. An open pollinated seed variety Sona has been released for cultivation by CIMAP especially for the northen part of the countyr. Senna can be grown on about all the different kinds of field soils found in the subtripical areas. The crop yields are higher when the plant is cultivated on light well drained sandy loam and lateritic soil of pH7-8.5. Senna is a plant of arid environment. Its crop do well in the warm subtropical areas. it is usually cultivated in areas where there is bright sunshine and little rainfall. The areas that receive rains frequently and/or get waterlogged and where temperatures remain low for serveral months are unsuitable for the cultivation of senna. The most suitable areas for the cultivation of senna in India are the dry areas of Haryana. Rajasthan, Gujarat, Maharashtra, Madhya Pradesh, Andhra Pradesh and Tamil Nadu. The land is prepared just before the sowing. A through pulverization of the soil is carried out by the use of the plough. The field is ploughed at least twice, harrowed and levelled. Fine tilth soil is not required of senna. The sowing time of senna seeds varies in the different parts of the country. It is arranged such that the flowering and the pod forming time of the plant does not coincide with the monsoon season. Senna crop is taken in the northern central region of India in the fields vacated by the rabi crops; mustard, potato or wheat. in such fields sowing is done between February-late March. In the western part of the country senna is sown in the rainy season between July and September. Senna can also be sown in the north central India during the rainy season. In Tamil Nadu, senna is sown in November after the start of winter monsoon there. The seeds rate in about 30kg/ha for the rainfed crop and 15kg/ha for crop raised under irrigation. The seeds are generally broad-casted, dry or after pre-soaking. They may be drilled in lines 30-50cm apart at a depth fo 1.5-2cm using some tractor driven mechanical device. If there is prolonged dry period after sowing a light irrigation is given to the sown field to ensure timely and uniform germination of seeds. The fertilizer requirement of senna are low as compared to the other crops. About 5 tonnes per ha of well decomposed farm yard manure (FYM) should be applied at the time of land preparation. Where the soil nutrient is expected to be low, 40kg of N and 40kg of P2O5 may be applied in the field immediately before sowing. Another 40 kg of N may be applied in three equal splits at 40, 80 and 120 days after sowing. Senna is an arid zone plant and can be cultivated as a rainfed crop. Its cultivation under semi-irrigated condition results in higher yields. For a good harvest of senna, 3-4 light irrigations may be necessary. One or two hand weeding followed by howing are necessary for the removal of dicot and grassy weeds. once the growth of senna plants picks up, the weeds get suppressed and further weeding is not necessary. The first weeding and howing should be done at 25-30 days and second one at 70-80 days and second one at 70-80 days from the sowing time. The biologically active compounds of senna used in pharmaceutical and food industries are present in the leaves and the pods of the plant. The flowering on the plants occurs usually after 90 days of plant growth. The pods formed from the flowers take about a month to mature Upto 3 harvests of material are taken from senna crop. The first harvest is taken when the plants are of 50-90 days age. In this harvest, bulk of the foliage from the top is removed. The plant throws up new branches in 3-4 weeks time when the second picking of leaves is taken. The plants are allowed to regrow. The final harvest is taken at about 150days of sowing. Now both the leaves and the pods are harvested. The produce of each harvest is spread in a thin layer in an open field to reduce the moisture content. Further drying of the produce is done in the well ventilated drinking sheds. The leaves and the pods usually dry up in about a weeks time. The colour of the dried up leaves should be yellowish green. If the drying is improper or delayed the leaves may turn black or brown in colour, an indication of the deteriorated quality of the produce. In locations/situations where the crop of senna is not desired to be rotated with other food and medicinal/aromatic crops, the senna may be ratooned and kept in the field for several cropping seasons. life saving irrigations should be applied as and when necessary. Mulching may also be practiced. A goods crop of senna gives 10q/ha of dry leaves and 5q/ha pods under irrigation and good management practices. The yield under rainfed conditions is about 7q/ha of leaves and 4 q/ha of pods. Under dry weather conditions, the crop of senna escapes any serious attack of pest. However, under highly humid conditions, the larvae of white butterfly, may cause serious damage. The damping off in seedlings is the most devastating disease caused by Rhizoctonia bataticola. Seed treatment with Thiram or Captan at 2.5g/kg protects the growing seedlings. Leaf sport and leaf blight are other diseases caused by Alternaria, Cercospora and Phyllosticta species, repectively, usually occurring at later stage of growth. Spraying of 0.15 percent Indofil M-45 at fortnightly interval for 3 times in a period of 5-6 weeks in recommended. The compounds isolated from Cassia angustifolia leaves are wax, myricyle alcohol, the flavonoids isorhamnetin and kaemp ferol and the anthraquinone rhien and emodin and phenolic compounds. Two glycosides, one easily hydrolysable yielding emodin and actively cathartic, the other hydrolyzable with difficulty and slow in laxative effect are also present. These glycosides namely sennoside A and sennoside B have the same formual C21H20O10 but differ principally with respect to linkage of glucose to the glycone moiety. In addition to these, the other compounds reported to have been isolated from senna are manitol, salicylic acid, chryophanic acid and sodium potassium tartarate. Senna is valued for its cathartic properties. A paste made of the powdered leaves and vineger is applied to skin diseases and eruptions. Senna is especially useful in the habitual constipativeness. It increases the peristaltic movements of the colon. The tendency to grip caused by senna may be oviated by combining it with aromatics or with a salive laxative. The pods have the same therapeutic effect as of the leaves but they cause less gripping. The green pods are more active than ripe pods. Senna is contraindicated in spastic constipation and in case of colitis. The cathartic principles of senna are soluble in water and dilute alcohol. India senna is reported to suffer no loss of activity even after five years of storage in a sealed vessel. The extract was stable in amber coloured bottles for 96 hours. Oil of Palmarosa is obtained from flowering shoots and above-ground parts of motia variety of Cymbopogon martinii (Roxb.) wats. The variety is also referred to as 'Rosha grass' or 'Russa grass' and yields an oil of high geraniol content (75-90%) which is also called East Indian Geranium oil or Russa oil. Another variety sofia is also found growing wild in India which yields oil of lower geraniol content, known as Ginger Grass oil. The oil is of inferior grade and fetches much less price than the palmarosa oil. Oil of palmarosa is one of the most important essential oils of India which is exported and once India was the principal supplier of this oil to the world. The market for the export has fallen because of deteriorated quality of oil, competition with other countries and appearance of synthetic geraniol in the market. In India, oil is mostly obtained from wild growing grass in the states of Madhya Pradesh, Maharashtra, Andhra Pradesh and Karnataka. A plantation of motia variety was started in Punjab in 1924. The late Prof. Puran Singh, Chief Chemist, Forest Research Institute and Colleges, Dehra Dun, succeeded in establishing the grass at Jaranwala (Lyallpur) over an area of 93 ha in a short period of 4-5 years. He put up a steam distillation plant and 1350-1600 kg of oil was produced annually. It was later cultivated near dehra Dun by Purandad Essential Oil Plantation (Industry) and oil of good quality is being produced at present. Recently, its cultivation has also been taken up in the states of Karnataka, Maharashtra and Uttar Pradesh. Palmarosa is a perennial aromatic grass, culm 3 m high; leaves linear-lanceolate, cordate and amplexicaul at base, 50 cm long, 3 cm broad, glabrous; panicles 30 cm long, turning reddish, often very bright when mature; racemes 15-18 mm long, occur in pairs, one subsessile and the other pedicelled, each raceme consisting of several pairs of spikelets, in each pair one is sessile and hermaphrodite and the other is pedicelled and male; the lower raceme base and the lower most pedicel swollen and connate to the base of rachis; sessile spikelet 3.5 mm long, lower glume 1 mm wide, ovate with deep median groove, broadly winged, 2-nerved, awn 12-18 mm long; pedicelled spikelet 4 mm long, 8-nerved. A well-drained sandy loam soil having irrigation facilities and receiving rainfall of about 150 cm annually is an ideal condition for cultivation of palmarosa. It also grows well in well-drained clay loam soil, free from waterlogging. If the soil is not well-drained or if after-heavy irigation, water remains standing in the field in hot weather, the groiwth of the grass is badly affected. Areas which are affected by severe frost are not suitable as the frost kills the grass and reduces the oil content. It is raised by: (i) transplantation of the seedlings and (ii) by slips of halthy plants. Nursery beds are well prepared in May. Raised beds are prepared as the seeds are washed off by irrigation. A good amount of farmyard manure should be used in the seed bed. As the seeds are small and light, they are mixed with fine soil for obtaining even istribution and ease in sowing. They are sown in lines, 15-20cm apart. Seeds should not be sown densely as this will avoid crowding of seedlings thereby resulting in proper growth of the plants. About 2.5 kg seeds are adequate to give seedlings for planting one hectare. The beds are watered lightly and regularly. Germination starts within two weeks. Later on, 0.2-0.5% solution of urea may be given for good growth. In about 3-4 weeks, seedlings are ready for transplanting. The seedlings are transplanted in the prepared fields as soon as the rainy season sets in, i.e., by June end or July. They can be transplanted even earlier, if the weather is not very warm and irrigation is available. The field is prepared before the onset of monsoon. It is ploughed and harrowed so as to give a fine tilth. All the stubble and roots of weds are removed. Healthy and established seedlings, which are about 15 cm in height, are carefully removed from the nursery and are planted in rows, 60 cm apart, with plants spaced at the same distance. In fertile areas, spacing should be increased. Plants giving a good yield and a high quality of oil should be used. In this way, it is possible to raise plantations yielding high quality oil, which is not possible when the plantation is raised from seeds as the seeds give rise to many morphologically indistinguishable different varieties. However, the rate of establishment of rooted slips is very poor as compared to nursery transplants. Slips can be planted in June-July or during the rainy season. Requirements of irrigation depend uponthe climatic conditions. The grass requires irrigation fortnightly during the growing season. With an ample supply of water, growth is luxuriant, but if drought prevails, growth is arrested, leaves wither and the oil content is reduced. Odour is an important factor of the oil quality and it is essential to keep the fields clean of other growing plants, particularly those which impart their own odour. Therefore, the plantation should be kept free from weeds by regular weeding and hoeing. Particular care is required in the initial stage of growth so that weeds do not overpower the grass. Distillation waste of this crop or citronella Java applied as organic mulch @ 3 tonnes/ha would be effective in controlling weeds. Among herbicides, diuron @ 1.5 kg al/ha and oxyfluorfen @ 0.5 kg al/ha have been found ellective for weed control for this crop. As the grass is perennial, it is necessary to replenish the soil. In fertile soils, manuring may not be required for the first two years. By manuring rich soils, the vegetative growth is increased and oil content may be slightly reduced. However, in general, 40 kg N, 50 kg P2O5 and 40 kg K2 O per ha are used as basal dose at the time of planting. About 60 kg N/ha is applied in three split doses during the growing season. The application of NPK should be repcated in subsequent years. The essential oil is distributed in all parts of the grass, viz., flower heads, leaves and stems, the flower heads containing the major portion. Usually, the grass is cut at a height of 5-8 cm from the ground level and the whole plant is used for distillation. The maximum yield of oil is obtained when the etire plant is a at a full flowering stage. The number of harvests depends upon the climatic condition of the place of cultivation and order of crop management. During the first year, usually one crop is obtained in October-November, whereas 2-3 crops are obtained in the subsequent years in subtropical areas in the North indian plains. Four harvests are taken in tropical areas of South and North East. Palmarosa plantation remains productive for about eight years. However, the yield of grass and oil starts decreasing from the fourth year onwards. It is, therefore, recommended that the plantation is kept only for four years. Oil of palmarosa in the country is generally obtained by hydrodistillation. The process is primitive and has remained unchanged over the years. The quality of oil suffers because of the crude method of production. To get a maximum yield of good quality oil, it is advisable to use steam distillation. The distillation equipment consists of a boiler to produce steam, a distillation tub, a condenser and 1-3 separators. The tub is made of mild steel and has a perforated bottom, on which the grass rests. The tub has a steam inlet pipe at the bottom. A removable lid is fitted at the top. Charging and discharging can be done in perforated cages with iron chains which can be lowered in the tub with the help of a chain-pulley block. Different types of condensers are available, but tubular condensers are better than others. 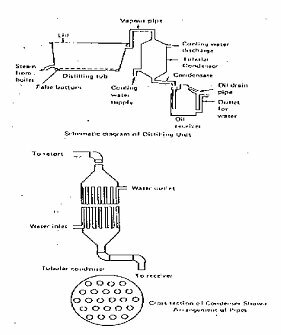 The condenser is provided with an inlet and outlet by which cold water flows through the chamber to cool the pipes for condensing the distillate. To obtain a maximum yield of oil and to facilitate release of oil, the grass is chopped into shorter lengths. Chopping the gras shas further advantages that more grass can be charged into the still, and even packing is facilitated. The grass should be packed firmly as this prevents formation of steam channels. Steam is allowed to pass intot he still with a pressure from 18-32 kg in the boiler. The vapour mixture of water and palmarosa oil passes into the condenser. As the distillation proceeds, the distillate collects in the separator. The oil being lighter than water and insoluble, floats on the top of the separator and is continuously drawn off. The oil is then decanted and filtered. Small cultivators can use direct-fire stills, but properly designed stills should be used. The stills are provided with a boiler at the bottom of the tub. This is separated by a false bottom from the rest of the tub. Water is poured into the bottom of the tub and grass is charged in the top portion. In the still, the water does not come in contact with the grass. For economic production of the oil, it is advisable that hte harvested material is allowed to dry for a short time. From the quality point of view, the grass should be distilled as fresh as possible. Oil obtained from dry or fermented grass is of inferior quality. The distillation unit should be clean, rust-free and free from any other odour. The oil should be free from sediments, suspended matter and moisture before storage. The container should be clean and rust-free. The content and yield of the oil depend upon many factors, such as climatic conditions of the place fo cultivation, time of harvesting, maturity of the grass, nature of material being distilled, i.e., fresh material or wilted material, method of distillation, etc. By growing the improved strain, a production of 80 kg oil would be possible in the first year and 80-100 kg of oil in subsequent years. Indian Standard Specifications for the oil of palmarosa (IS: 526-1986) are given in Table 1. The characteristic features of oil of palmarosa are first, its sweet odour; second, the solubility test in 70% alcohol; solubility of oil in 2.2-4.2 volumes of alcohol indicats a higher percentage of free geramol. Oil of palmarosa chiefly contains 75.0-95.0% alcohols, calculated as geraniol, a small but varying amount of esters of the same alcohol, principally acetic and caproic acids. 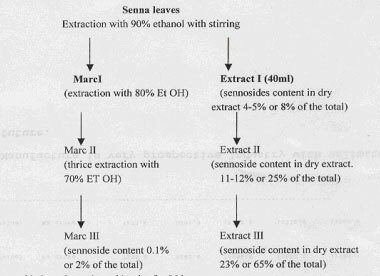 Java oils also have almost the smae geraniol content but their ester content is higher. Oil of palmarosa is used in perfumery, particularly for flavouring tobacco and for blending of soaps due to the lasting rose-note it imparts to the blend. In soap perfumes, it has a special importance by virtue of the fact that geraniol remains stable in contact with alkali. It also serves as a source for very high grade geraniol. "Geraniol is highly valued as a perfume and as a starting material for a large number of synthetic aroma chemicals, viz., geranyl esters which have a permanent rose-like odour.